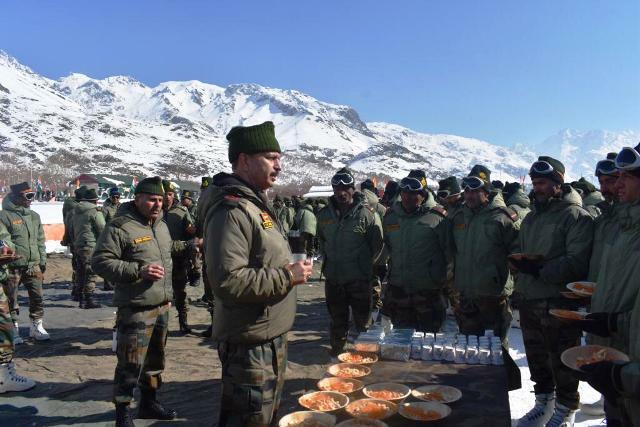 Leh, November 06 (Scoop News)-Lt Gen YK Joshi, GOC Fire & Fury Corps accompanied by GOC ‘Forever in Ops’ Division interacted with troops deployed in sub zero temperatures on the rugged and mountainous locations of Western Ladakh on the Diwali eve today. Gen Joshi wished the troops and their families a Happy Diwali. He complimented the troops for their service to the Nation in such remote and inhospitable terrain and weather conditions. Later in the day, the General Officer paid homage to martyrs at the Kargil War Memorial, Drass and interacted with troops .